Redistricting is an issue that must be addressed by every political body. Redistricting is the redrawing of boundaries for areas from which people elect representatives. Both State Law and Federal Law require election districts to be representative of its voting popoulation and to be examined using data from the decennial Census. The data was delivered to Congress and must be delivered to States no later than April 1, 2011 (1 year after Census Day). 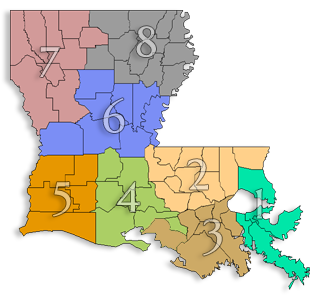 Based on election cycles of 2011 and requirements of Louisiana law, it is urgent that local governing jurisdictions in Louisiana make arrangements to conduct an immediate and timely redistricting/reapportionment process. A reapportionment plan must be completed in time to review the proposed plan, have a public hearing, respond to issues from the public hearing, prepare ordinances and resolutions, accept the plan, and submit it to the appropriate bodies, including the U.S. Department of Justice, in a timely fashion. Each reapportion plan must be approved and accepted for implementation prior to the next qualification of elections. In effect, this requirements tightens the time availability for completing the prcoess due to Fall 2011 elections. The Louisiana Association of Planning and Development Districts is comprised of all 8 State Planning Districts working together as partners to advance the development of Louisiana. LAPDD has specific interests in recovery and resiliency, job creation and retention, and capacity.